The February 7th edition of The Economist left me with mixed emotions. On the one hand, as a proud German-American, I was quite pleased to read an article titled, “German-Americans: The Silent Minority.” On the other hand, I was disheartened when I read the piece, “Germany and America: Ami Go Home.” The first piece was nice because it discussed the legacy and traditions of Germans here in the U.S. (and in particular my state of Wisconsin). The second article, however, is the one that I’ve been thinking about for the past two weeks. Since the “Ami Go Home” piece only presented data on support for the Transatlantic Trade and Investment Partnership (TTIP), I want to present some other data concerning Germany’s sentiment towards the United States. 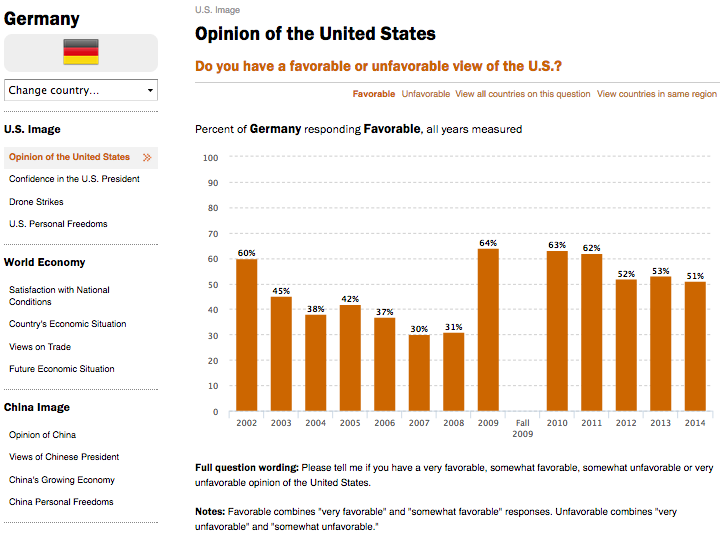 First, the most recent polling data (July 2014) from the Pew Research Center shows that only 51% of Germans have a favorable view of the U.S. This puts Germany in the category of Top 10 Global Critics of the United States. 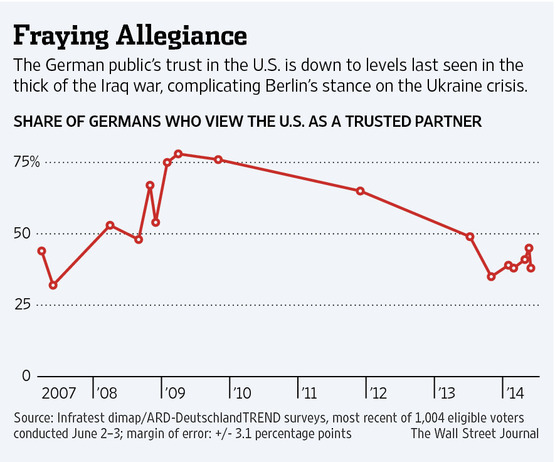 Second, a June 2014 article in the Wall Street Journal had this to say about relations between the two countries: “German government officials readily acknowledge that anti-Americanism—fueled most recently by revelations of National Security Agency surveillance activities in Europe—plays a significant role in how the public perceives the Ukraine crisis and has bred a reluctance among many Germans to side with the U.S.” The piece also included polling data with a very telling caption. Given the importance of the transatlantic community in facing current global challenges, and recognizing the role that German plays in European politics, it is in the best interests of the United States to improve relations with Germany. The question now is how to best go about that. What follows are four programs that could help with the rebuilding process. US-German relations have slowly deteriorated the past few years and took a big hit in the wake of the NSA scandal. Given the importance of Germany to the U.S. economy and in dealing with Russia, it is incumbent upon the U.S. to build them back up. If you know of any other programs that should be mentioned here, please mention them in the comments below. Thanks for reading my blog and mentioning the role of the embassy and consulates.